← RP: Wait long enough and they die. Problem solved! I'm not sure this qualifies as a "Bad Super Costume", but I think it does a nice job of illustrating some of the problems inherent in using spandex as a covering material, problems most artists just gloss over. I think the flaps of the tunic fluttering back are a particularly nice touch, framing the ... area of primary interest quite well. Why do I get the feeling that his battle cry is nothing more than a series of cackling grunts and heavy breathing? 18 Responses to Engage Thruster! Kinda looks like he found Ms. Monroe’s favorite subway grate, doesn’t it? Ok, lets break this down a bit. 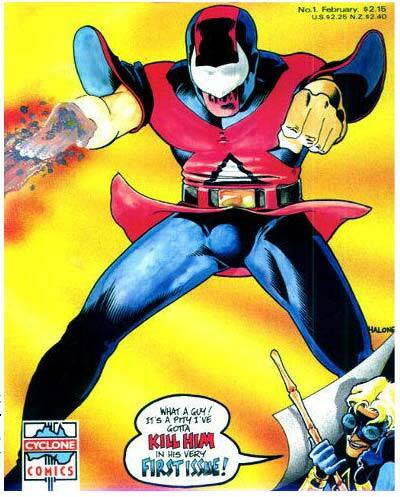 Mask could do without the whole white pointy eared shape. The flappy sleeves have got to go. Same for the ski… GAH! CHRIS O’DONNEL CODPIECE! AAAAAAAAHHH!!!! I think the energy beam comes out of the wrong place. Oh, wait… I take that back. In his defense, he must be very excited. It’s his first issue! …unless Stick-guy is talking only about his crotch, which is what he’s pointing at. He looks like a blend of Thanos, Wonder Man, and Jack of Hearts. Out of curiosity, who the hell is this guy? I don’t see a title on this very first issue cover. Not the wisest of marketing ideas. It’s a popular British character, Dark Nebula, apparently. I took the image from “The International Superheroes” site. I frankly don’t know anything about the guy except that he is very, very cocky. Ahem. This picture supports my theory that superpowers are also super viagra due to massive overdose of adrenaline and testosterone. I always thought X-stacy was a guy, but I guess I was wrong. Why, Worf, the resemblance is uncanny! But I’ve never heard of her. Maybe we both came from the same factory. Funny, I’m often mistaken for a lesbian on the interwebs. It must be my Chat Roulette screen name: xX_Im_a_Lesbian_Xx. In retrospect, I can see how that might be a bit misleading. beware evil doers! I have a BIG package (of justice) for you! wonder how this fight turned out? one big stick and one big package?